It was the night before CocoaConf. I had just walked into the hotel bar. A table full of wise guys (wise as in Stooges, not Sopranos) called out to someone named Nerd. “Hey Nerd!” they shouted again. This time I looked at their lanyards and badges. Same as mine. They were talking to me. Complete strangers, but not for long because they invited me to join their table. I was immediately comfortable when the discussion turned to midichlorian levels and LEGO’s model of the Millenium Falcon. Camaraderie like this is why I go to conferences. Earlier that day I listened to the author of a popular iPad app as he described the challenges of writing 3D graphics code. The newest iPad was delivered during CocoaConf, so this room full of Mac devs was pumped! I go to conferences for discussions like this. It’s a little after 5am as I type this blog entry. I’m excited about the presentations scheduled for this morning, so excited that I had to get up a few hours early just to write about it. Excitement like this is why I go to conferences. 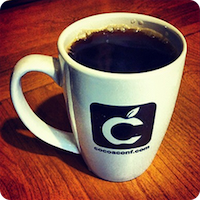 I attend CocoConf because developers are part of a bigger community with a common goal: Getting better at what we do. Books and videos are a good start. Classes are helpful. But beyond the standard learning tools, sometimes a good one-on-one discussion with a fellow dev will help both people to look at a concept in a fresh way. To solve a knotty problem. To resolve a debate about midichlorian levels. Everybody learns when we share ideas. I look forward to the next CocoaConf. Note: The author originally posted this article at Built in Chicago in March 2012.